Bhutan : When and where to go? The climate of the country is very varied according to the altitude: tropical type to the south, the presence of the Himalayas to the north makes it more rigorous. Between September and November is the most pleasant period, with a clear time, which allows the practice of the trek in good conditions, and it is the same in spring, from March to May, with in addition the flowering Superb rhododendrons. In December and January, you will encounter a colder weather, but as tourists are less frequent, it will be more interesting financially. Avoid, the period from June to August, because of the monsoon. If you want to make your trip coincide with the traditional festivals, know that there are almost all the year round. 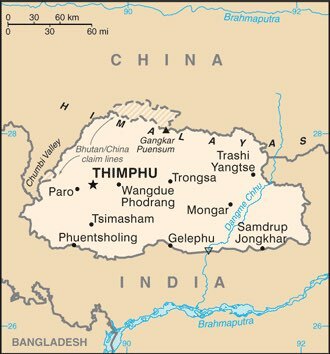 Bhutan is bordered by Tibet to the north and India to the south: a small country shaped by tropical plains on the Indian border and high valleys in its Himalayan part, it was for a long time unknown to travelers and placed under the authority of Buddhist monks before being today a kingdom, with less than a million inhabitants. We can now discover this country of the end of the world, its incredible landscapes, its practice of traditional agriculture which is its main resource, and its astonishing customs. You can start with the capital Tiumphu, set in a wooded valley, with the old charm of its colorful houses and not a single red light! Several sites are to be seen: the Trashi Chhoe Dzong, Fortress of the Glorious Religion, which houses the king's offices; The National Institute for Zorig Chusum, a school that teaches traditional arts to children from all over the country; The National Memorial Chorten, a religious monument where one can see Tantric statues and sacred pictures, but which is also a place of worship where hundreds of Bhutanese circulate permanently; The Weekend Market where villagers come to sell their products; The Changlimithang Stadium where the archers train for this national sport which is practiced in traditional dress; The National Institute of Traditional Medicine, where medicines are manufactured with more than 300 plants to be sent to the four corners of the kingdom. Paro, in the west of the country, is located in a fertile valley, and the landscapes are sumptuous. You will see the National Museum which plunges you into the culture of the country, but also the Taktshang Monastery which dominates the valley, sacred site of the kingdom. It is also near Paro that the airport is located. You can enter Bhutan with a visa (by way of a tour operator) plus the unavoidable conditions: present the planned itinerary and pay 200 to 250 dollars per day. All foreigners must travel through a travel agency that offers organized tours. The current currency is ngultrum, but Indian rupees can be used throughout the country. You will arrive by the international airport of Paro, via New Delhi, Singapore, Kathmandu or Bangkok. To travel in the country, you have the choice between the road and ... your feet! The road can be blocked by various unpredictable causes (snow, mudflow, falls of stone, etc. ), so take your trouble patiently, whether you are in a vehicle chartered by your tour operator or in a public bus. Inner airlines are currently being planned. The budget: the $ 250 payable per day for group tourists includes accommodation, on-site transportation, meals, tours and guides' salaries, plus the cost of any shows, horseback riding Or other outputs. From the point of view of health, the risks are of the same type as in the other countries of Asia: vaccine against yellow fever required, risk of turista, infectious diseases. It is of course advised to have its classical vaccinations up to date. For the followers of the trekking, be vigilant with the evil of altitude. And plan seals against travel sickness for road trips, which are very winding and in fairly bad condition. As for your safety, there is no real problem: there are very few robberies and almost no attacks in Bhutan. Shopping: you will be able to bring back very original and extremely well-crafted handicrafts, cotton, silk, wool, tapestries, jewelery, wood carvings, paintings, bamboo boxes or boots embroidered with traditional motifs.